David Pickering says he is happy to be judged on his record as Welsh Rugby Union chairman ahead of a proposed challenge by David Moffett. 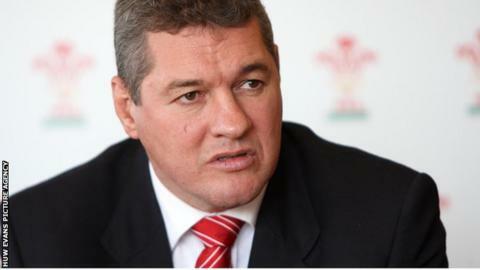 Moffett, the former WRU group chief executive, has said he wants to stand for election to the governing body. Pickering, who was elected in 2003, said: "Before I became chairman we hadn't won anything for 27 years. My record speaks for itself." The next full WRU elections take place in August. Moffett needs two of Wales' 320 clubs to nominate him for election. Pickering, the former Wales captain and national team manager, has overseen unprecedented success at Test level while at the helm of the governing body, but the WRU has also experienced a strained relationship with the four Welsh regions - Scarlets, Ospreys, Cardiff Blues and Newport Gwent Dragons. The dispute between the two sides has encompassed funding and the release of players for international duty. Moffett's 17-point manifesto proposes more money for grassroots rugby, a better relationship with the regions and to renegotiate the WRU's debt. But Pickering says he remains focused in his role as chairman. "I am quite single-minded. I want the best for Wales. I will not be distracted," he said. "I have delivered that over the past 10 years. Look at my record - the debt is reduced by some £50m and we have won the Grand Slam and [Six Nations] championship four times." Ex-Wales captain Gareth Llewellyn has said Pickering does not have to answer to Moffett unless an extraordinary general meeting of the WRU is called. "[Unless] he gets the clubs to ask him to represent them at an EGM then it [an EGM} is never going to happen... then we will have the debate," said Llewellyn. While Wales have enjoyed success at Test level during Pickering's reign as chairman, the Welsh regions have struggled in the Heineken Cup and the Pro12 in recent times. This season, a Welsh region have failed to reach the Pro12 play-offs for the first time, while the Cardiff Blues were the last region to reach a Heineken Cup quarter-final - in 2012. The regions have been unable to compete with big-spending clubs in France and England. Welsh internationals George North (Northampton), Richard Hibbard (Gloucester), Bradley Davies (London Wasps), Jamie Roberts, Dan Lydiate, Mike Phillips (all Racing Metro), Ian Evans and Leigh Halfpenny (both Toulon) and Jonathan Davies (Clermont Auvergne) have all left Wales for the Aviva Premiership and the Top 14. A new European Rugby Champions Cup will begin for the 2014-15 season and a new qualifying process from the Pro12 has been introduced, but a fresh deal between the WRU and the regions has still not been agreed, with the current contract due to expire on 30 June. Pickering revealed meetings between the two sides have been taking place since 6 January, and he hopes a new Rugby Services Agreement between the WRU and the regions will be agreed soon. "We are working with our regional partners," said Pickering. "The competition structures are now in places, with Europe and the Celtic League, and I think the competition structure will help us. "That will help increase the amount of money coming into the Welsh game, which will make us more competitive." He added: "We will do whatever we can to support our regions, but we cannot bankrupt the union [WRU]. "There will be a defined amount of money we have to give to our game at regional level, semi-pro level and the community game."